The ability to tell accurate news from fake news is an important skill that you'll use for the rest of your life. 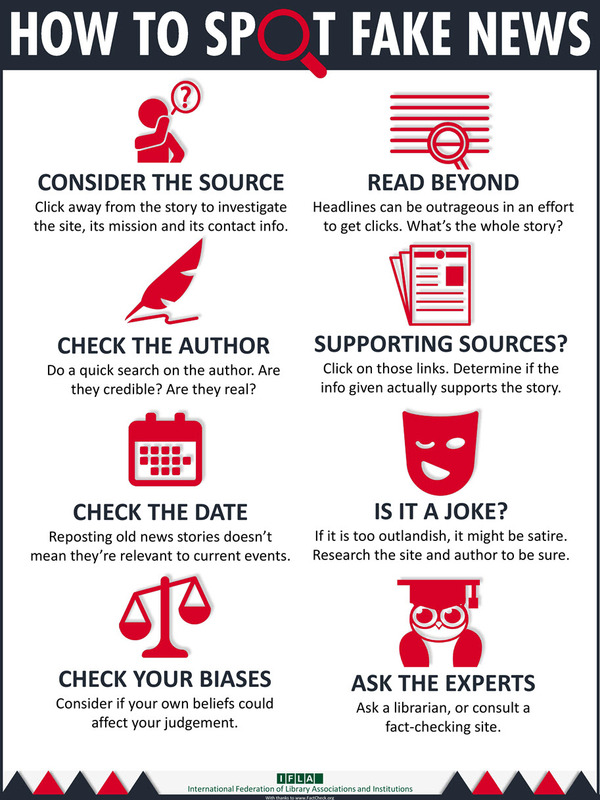 This LibGuide offers insight into how to tell fact from fiction online, plus a chance to exercise your newfound media literacy skills through games and interactive exercises. From the Shorenstein Center at the Harvard Kennedy School, links to peer-reviewed articles. A surprisingly difficult quiz on spotting images from fake social media sites. The Exercise: Your job is to fact-check the content, evaluate the author's background in the subject he/she writes about, and determine the journalistic standards, values, ethics, or guidelines used by the source. Can you find a standard of commitment to journalistic integrity in these news sources? Credit: Links to articles created by Kelee Pacion, Mann Library, Cornell University. Social media and web search engine algorithms are deliberately opaque. Algorithms often reinforce our existing biases. Unlike media stories, how these online tools distribute fake news is not open to scrutiny. In this opinion article from the New York Times, "How to Monitor Fake News," Tom Wheeler suggests a way to open up social media algorithms to public scrutiny without compromising individual privacy. From McGill University. A weekly news feed debunking myths and fake news online. Center for News Literacy, Stony Brook University School of Journalism. Facing History and Ourselves: Topics. Credit: Facing History and Ourselves. Lesson 3: "Confirmation and Other Biases." The News Literacy Project, combined with Facebook, have developed a fake news identification project geared for middle school and up. Manipulate the public by becoming a fake news guru. For iOS only. Spread misinformation via a choose-your-own-adventure setup. 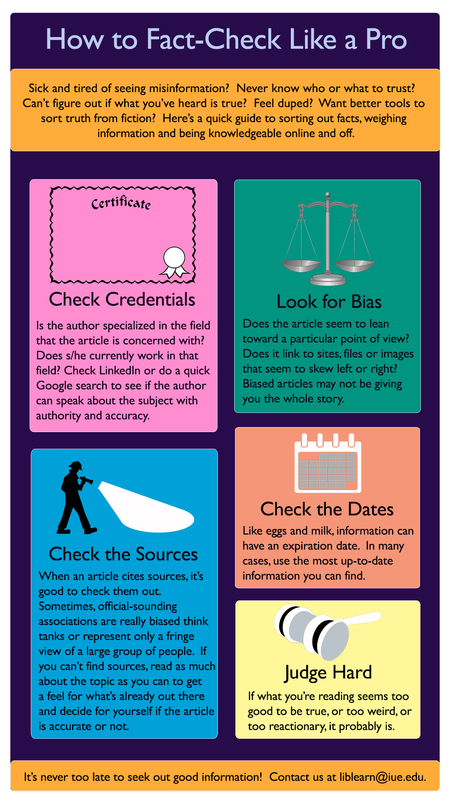 Definitions used by Melissa Zimdar's Open Sources project that classifies websites for credibility. Rumor Mills: Sources that traffic in rumors, gossip, innuendo, and unverified claims. State-sponsored News: Sources in repressive states operating under government sanction. Propaganda. Hate News: Sources that actively promote racism, misogyny, homophobia, and other forms of discrimination. Clickbait: Sources that provide generally credible content, but use exaggerated, misleading, or questionable headlines, social media descriptions, and/or images. Proceed With Caution: Sources that may be reliable but whose contents require further verification. Political: Sources that provide generally verifiable information in support of certain points of view or political orientations. 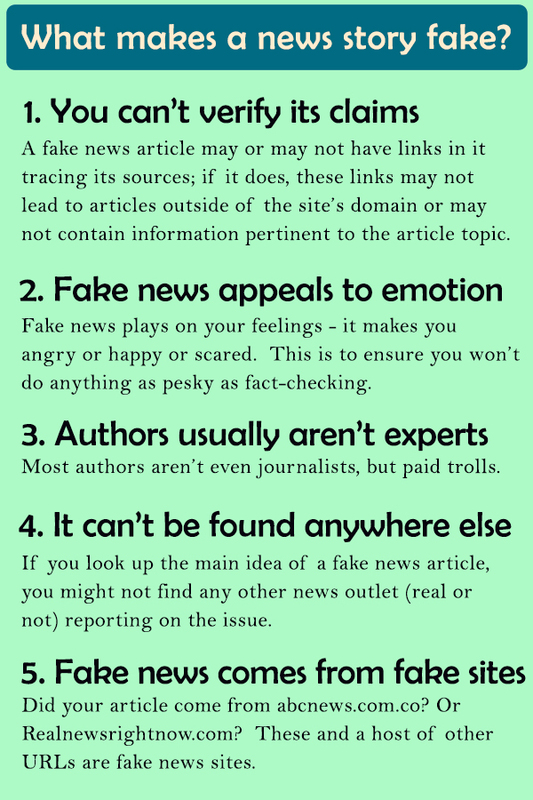 Credible: Sources that circulate news and information in a manner consistent with traditional and ethical practices in journalism (Remember: even credible sources sometimes rely on clickbait-style headlines or occasionally make mistakes. No news organization is perfect, which is why a healthy news diet consists of multiple sources of information). 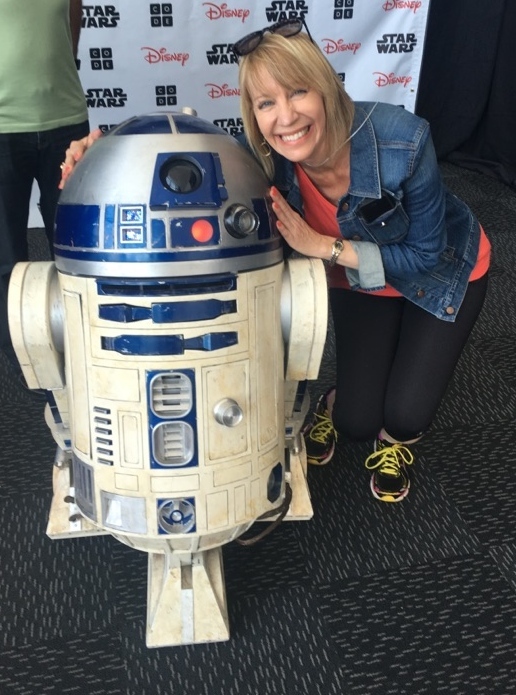 Teacher Resources: Media Literacy, Gov't.